There are guys that do this ride without a bike seat. There’s a guy that does at least part of this ride on a unicycle. 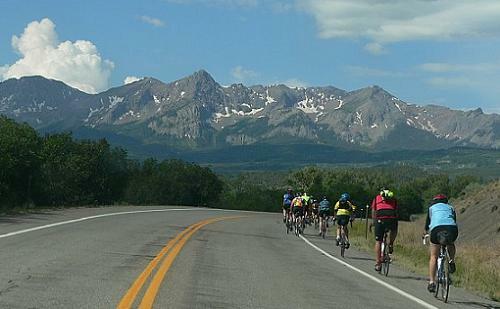 There was even a guy I rode by in the 2007 Ride the Rockies (RTR) that was wearing a helmet with a Coors can dangling out in front of his face. It may have been full. It could have been cold at that altitude. The same goes for the guys and gals that do this ride on a hand crank recumbent of which I have become all to familiar after riding only 53 miles through the hills of Central Florida for bikeMS. So why should I worry about a fractured pelvis? That was weeks ago! And oxygen, there’s plenty of that to come home to. I will be riding with my brother Dan and friend Kevin Moore on the Bicycle Tour of Colorado 2011, a 7 day bicycle tour in the Colorado Rocky Mountains. Touring the Central Rocky Mountains, I’m looking forward to riding through Rocky Mountain National Park on Trail Ridge Road on Day Two (to be posted later) There should be some great mountain panoramas to enjoy especially since I will most likely be climbing slowly. I’ll be screaming “literally” “no seriously” on the descents. So those of you that enjoy traveling 35-45 mph on a motorized vehicle try it on a bike with a frame that weighs no more than your favorite outdoor lawn chair, wheels that could double as a large frisbee your dog Flee could play catch and fetch and tires that span less thana single tread than your favorite Ford F-15 pick-up. I will be leaving RI from a business trip Friday, June 17th to arrive in Denver. Meeting me in Denver, from a long drive from Chicago, IL who are accompanying (baby-sitting) me on my trip are two seasoned veterans of riding the Rockies, my brother Dan and our good friend, Kevin. 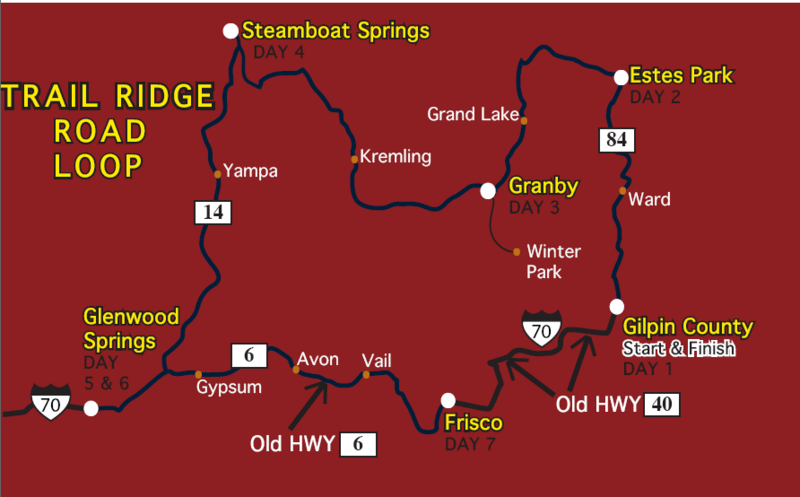 We will head to Blackhawk and begin our journey Day One, Sunday, June 17th a 60 plus mile trip to Estes Park. I will keep you “posted”. Wish us well! Below I’ve posted the 7 Day Route Guide. I hope to be sending a daily update as we finish each days rides and explore some of the more interesting mountain towns along the way.